Kitchens are going to become smarter and more integrated in 2017. The year is nearly over, and it’s never too soon to start looking forward. 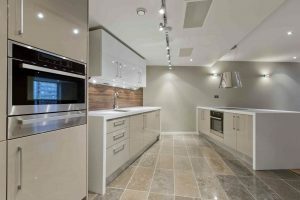 If you’re planning a kitchen remodel in the new year, why not consider what’s trending? Here are a few kitchen design trends that may end up shaping the market in 2017. In the 1950’s, vibrant colors dominated much of kitchen design. While current kitchens aren’t quite returning to that same level of excitement, kitchen designers are increasingly looking for ways to make things pop. “Tuxedo kitchens” are one such example. This color-blocked style usually involves white (lighter shade) on the top layer of the kitchen and black (darker shade) on the bottom cabinetry units. White and gray remain popular along with rich deep brown stains or complimentary blue tones. Another thing we are seeing is a push for alternatives to the ho-hum of plain stainless steel. A recent study from Houzz.com showed that 2 out of 3 people were interested in trying an alternative to stainless steel. The result? Many industry leading appliance makers are now offering stainless steel appliances in a variety of new colors such as black and bronze. To achieve a completely seamless look, homeowners and kitchen designers are increasingly turning to solutions that keep appliances hidden when they’re not in use. Even smaller appliances such as coffee makers and microwaves are being made to blend in with surrounding cabinetry. This is especially attractive to people who like to entertain and spend a lot of time in the kitchen seeking a cozier, more homey feel. People have expected home automation to become popular for some time now, and this trend is expected to continue to grow in 2017. Smart appliances will let you brew a pot of coffee, preheat your oven, and change your lighting — all while you’re away from home. Some ovens will even notify your smartphone when your roast has achieved the correct temperature. In today’s tech hungry world, smart appliances are slated to become even better while being more efficient, and powerful. This entry was posted on Friday, November 18th, 2016 at 1:59 pm. Both comments and pings are currently closed.